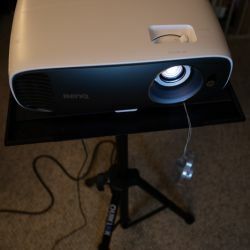 REVIEW – For many years I have had a fascination with projectors, and much more so when they became 4k capable. 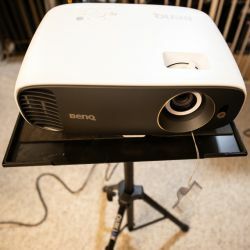 After much window shopping, I got the opportunity to test and review the BenQ HT2550 4K UHD HDR Home Theater Projector. Let’s see if the excitement was worthwhile or not!! 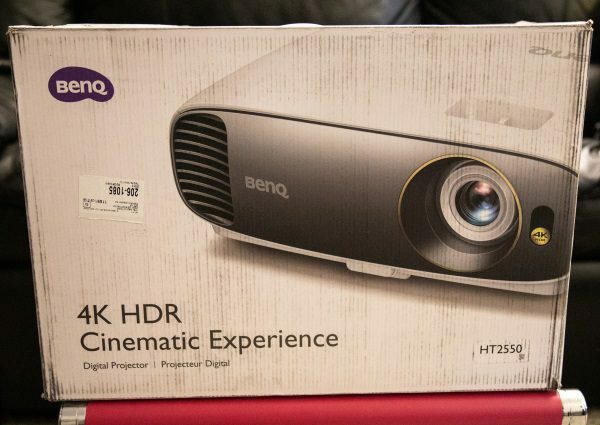 The BenQ HT2550 HDR XPR UHD DLP Home Theater Projector uses XPR technology to project UHD 4K resolution video. It features HDR10 compatibility to produce a wide color gamut and outputs up to 2200 ANSI lumens of brightness. 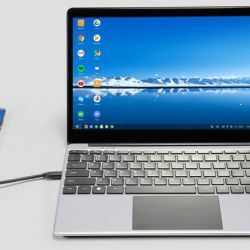 It has a 10,000:1 dynamic contrast ratio to help produce details even in dark areas of the image and a built-in 5W speaker for additional convenience. 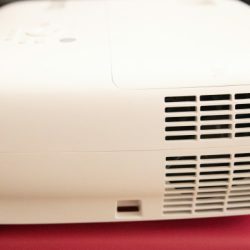 On the front of the projector from left to right, there is an air vent on the left and on the right the lens and the IR Remote Sensor. Audio output jack, RGB (PC) signal input jack, HDMI input port (Version 2.0), HDMI input port (Version 1.4a), USB Mini-B port (for firmware upgrades), RS-232 control port, USB Type-A port (1.5 A power supply), and a 12V DC output terminal for triggering external devices such as an electric screen or light control. 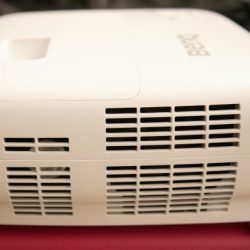 On both sides of the projector, there are air vents that help to keep it very cool. 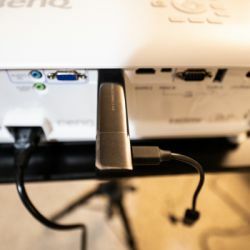 On the top rear of the projector, there are buttons that allow you the options of manually controlling the projector as opposed to using the remote. 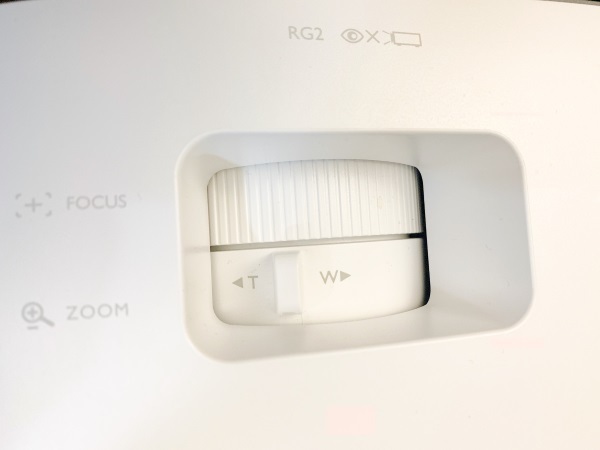 On the top front of the projector positioned behind the lens are two controls that allow you to adjust the zoom and the focus. 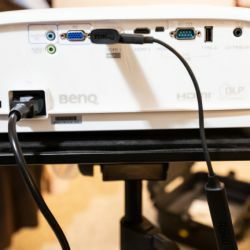 The BenQ HT2550 4K UHD HDR Home Theater Projector came well packaged as is usual for BenQ equipment, and it was remarkably easy to set up. 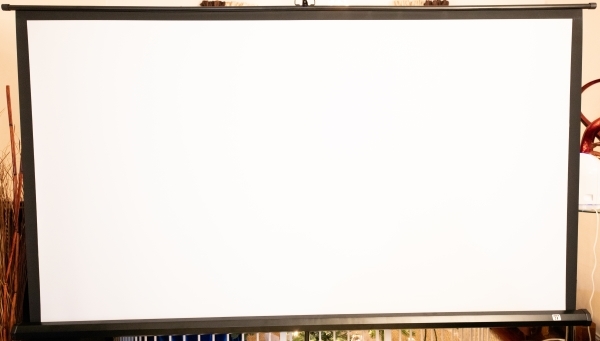 The first thing I did was to understand the average distance that was necessary to have the picture fully cover the 100″ portable projector screen that I purchased. If you look at the chart below, you will get an idea of the requirements. 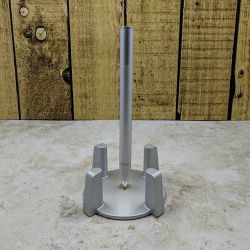 Once I placed it on the projector stand that I had previously owned but was using for another purpose, the next step was to understand the inputs and what devices and video sources could be used and how they could and should be connected. 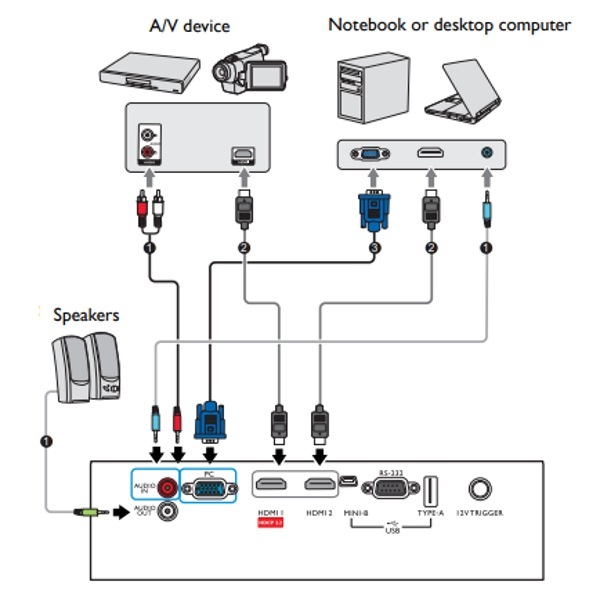 The next chart below provides more detail about the use of the HDMI and PC connections. 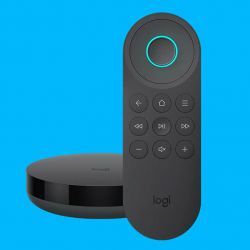 For my testing and regular viewing, I used either my 4K Roku Premiere+ stick or my Amazon 4K Fire Stick, and I used them in the HDMI 1 port. I made slight adjustments to the leveling feet, and then I turned on the projector. 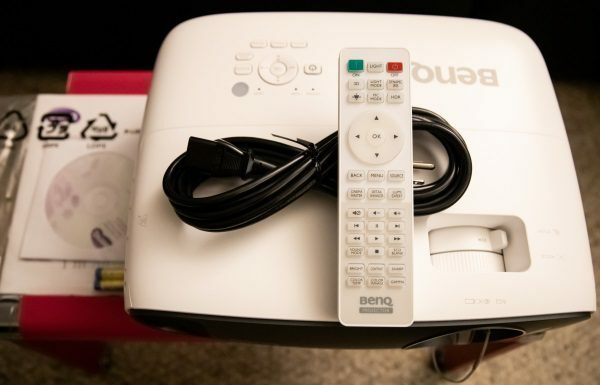 After a few seconds, the BenQ logo appeared on the screen. I adjusted the focus and zoom via the controls on the top of the projector until I got the sharp and crisp image that I was seeking to display. For this testing, I used the remote control for all of the setups and controlling. 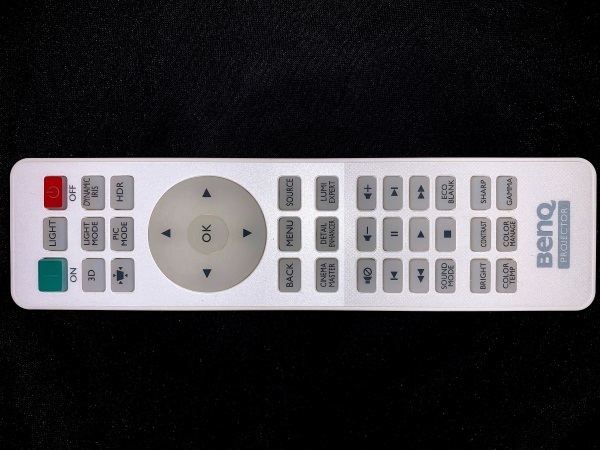 The remote control is backlit and includes several one-touch buttons that provide shortcuts directly to specific functions. 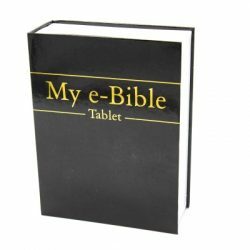 Click here to download the complete user manual. After going through the easy setup, I was ready to see this beauty perform. 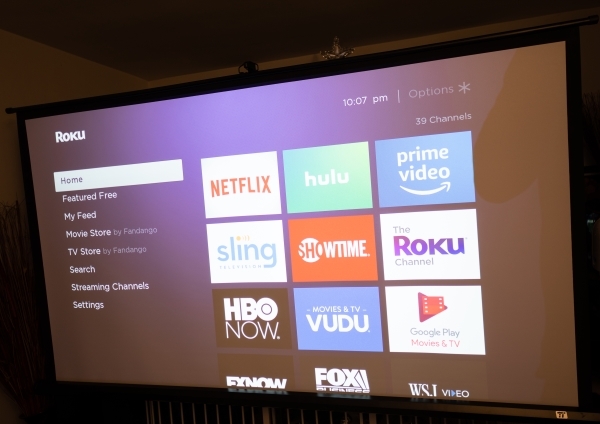 For my testing, I selected the 4K app from the Roku menu and wow!! 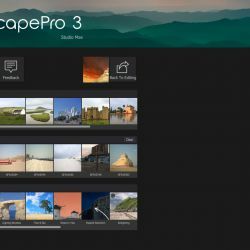 the video and images were and are stunning. 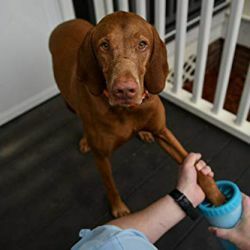 It is really and truly an immersive experience, and with a 100-inch screen at about 10 feet in front of me, I felt that if I had better acting skills I could just walk right into the screen and be a part of the movie. This projector produces a beautiful picture and provides an impressive overall home theater experience. 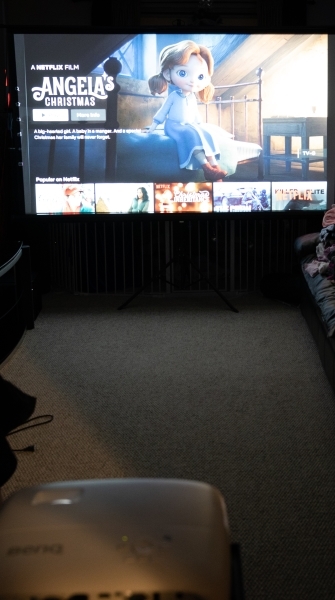 The following pictures show the projector with the Roku stick attached as well as the Roku splash screen and the projection of a movie selection that I was about to play for my kids. 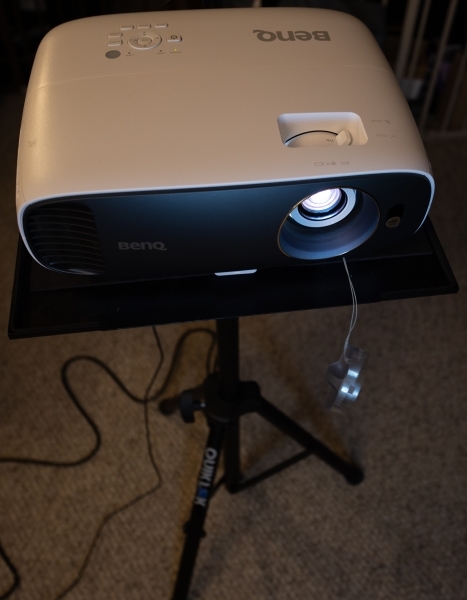 I am so happy that this BenQ HT2550 was the first home projector that I have been able to test and review. 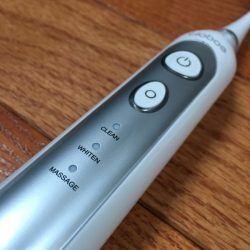 I am thoroughly enjoying the experience and it is used every weekend at my home. The picture is quite amazing and in 4K I become totally immersed. The addition of a sound bar and subwoofer have completed the cinema experience and even more so since I can select modes to match the show. While I am sure that several companies including BenQ have even higher-end projectors with even more amazing features and video reproduction, for now, this one has set the acceptable standard of measurement for any and all other home projectors that I review and/or experience. 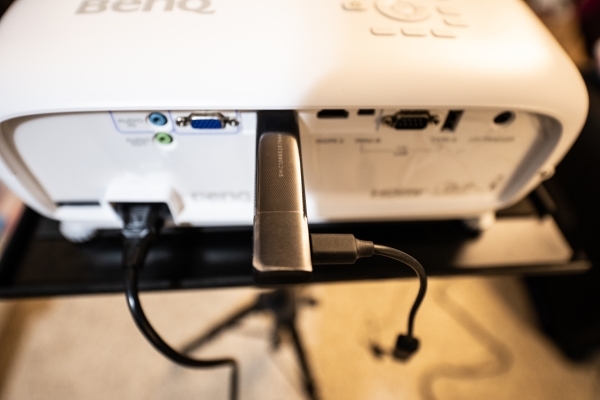 Well done BenQ!! Two thumbs up!! 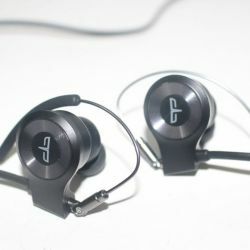 I have the BenQ 1070 which, I find to be a wonderful unit. 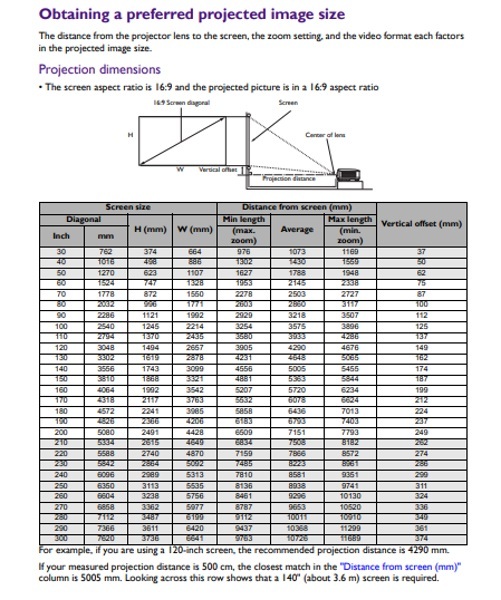 I have had several different units and have had large screen TV(s)/projectors going back to the 1970s. 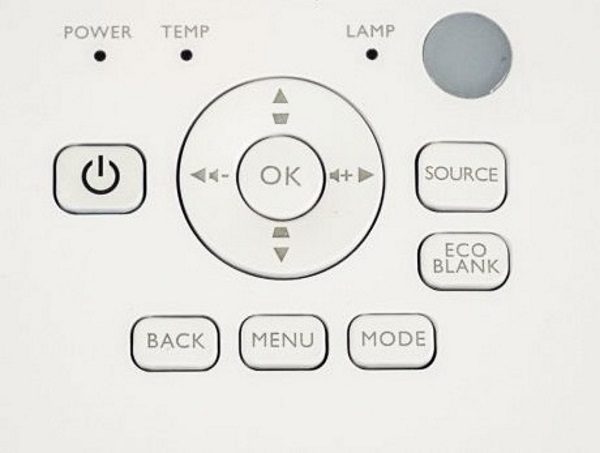 The remote on the unit reviewed looks very much like my BenQ remote and if it is the same I find it not very user friendly (maybe the remote for this unit stays lit longer than mine)…when watching and needing to make adustments (i.e. 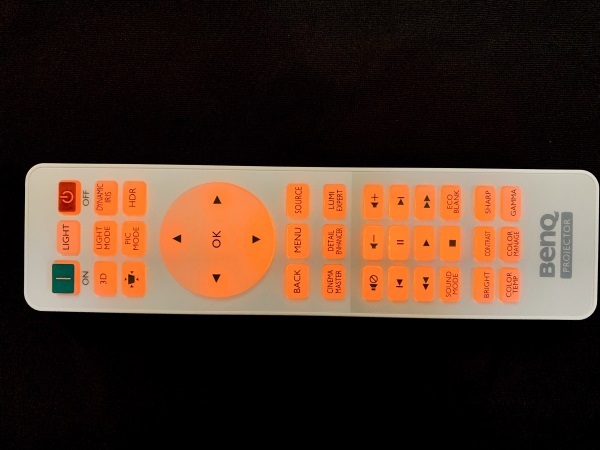 3D) it very difficult to find buttons in the short time the remote remains illuminated…this is not a problem if you are always using the same controls, but is a problem otherwise. 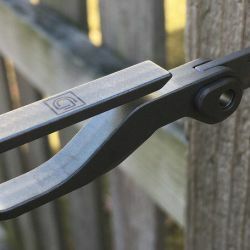 Otherwise I find my unit excellent, BenQs an excellent value, and support wonderful when needed. 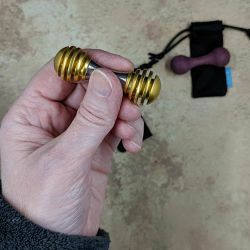 thanks for the quick review. 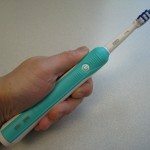 All the reviews i have read are in line with what you mentioned. 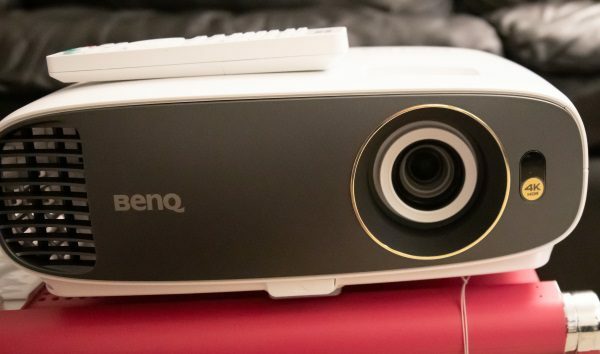 this is an amazing projector for the money. 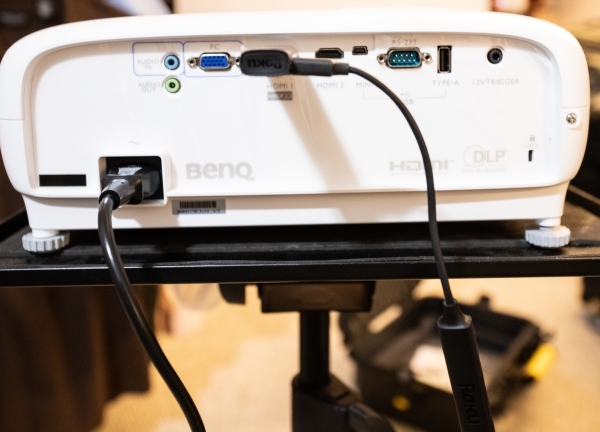 Waiting until CES 2019 to decide whether to buy this unit or newer one from Benq if announced. 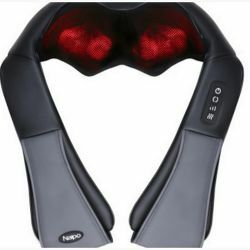 I like the 3 year warranty and excellent customer service that everyone talks about.